1.1 On all offers, orders and agreements of SvS Design in exclusion of any other terms and conditions these Terms of sale ( "Terms). These conditions have been filed with www.voorwaarden.net: http://www.voorwaarden.net/details.php?id=bba0ccbee06404fab7694197f79297b1. 1.2 The acceptance of an offer or make an order means that the applicability of these Conditions accepts. 1.4 All the rights and entitlements, as in these Terms and any further agreements for the benefit of SVS Design be stipulated, as stipulated in favor of SvS Design enabled brokers and other third parties. 2.1 All of SvS Design offers its obligation and SvS Design expressly reserves the right to change the prices to change, particularly when, on the basis of (legal) requirements necessary. See also Article 3.6. 2.2 An agreement is achieved only after acceptance of your order to SvS Design. SvS Design is entitled motivated to refuse orders or special conditions on the supply to connect, unless expressly provided otherwise. If an order is not accepted, shares SvS Design, this means within ten (10) business days after receipt of the order. 3.1 The prices for the products and services are in euros, including VAT and excluding handlings and shipping, taxes or any other taxes, unless otherwise stated or agreed in writing. 3.2 Payment must be without discount or compensation within fourteen (14) days after the invoice. 3.3 Payment can be made on (one of) the way (s) as specified in the contract. On your order may further (betalings-/bestel) conditions. 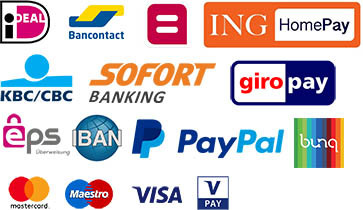 When paying by bank or giro date as the date of payment of credit to the bank account or giro-of SvS Design. 3.4 Where are you from the payment date that payment should have been held in default and are you from that day a delay of 1% per month or part of a month on the outstanding amount. If payment is made after notice by SvS Design are you an amount of twenty-two and sixty-nine euro cents (€ 22.69) to cover administration and payable if SvS Design his claim to outsource debt collection, you are also owed the collection, which at least fifteen percent (15 %) of the outstanding amount, subject to the jurisdiction of SvS Design instead to the actual out-collection costs to be recovered. 3.5 If you are single payment in default, SvS Design entitled (the implementation of) the Agreement and related agreements to suspend or dissolve. 3.6 If the prices for the products and services increased in the period between the order and its implementation, you will be entitled to cancel the order or the agreement to dissolve within ten (10) days after notice of the price increase by SvS Design. 4.1 Delivery SvS Design is with speed but at least within thirty (30) days after the order, by SvS Design unless otherwise indicated. If timely delivery is not taking place, then you will receive within 1 month after placement of the order message, and you have up to the time of delivery the right to dissolve the agreement free of charge by written notice thereof to SvS Design. Exceeding the delivery gives you no right to compensation. 4.2 Delivery will take place at the time the product by (or on behalf of) you receive is taken. 5.1 Ownership of products only passes if you already have what you under any agreement are due to SvS Design, has met. The risk for the products is already at the time of delivery to you. 6.1 You should all intellectual and industrial property rights which rest on the SvS Design products completely and unconditionally respect. 6.2 SvS Design does not guarantee that the products you do not infringe on any intellectual (unwritten) and / or industrial property rights of third parties. 7.1 You have the obligation to the products immediately after receiving technician. Any weaknesses shown you the latest, within two (2) months after discovery in writing and motivated to SvS Design yourself. 7.2 If it was shown that the products do not meet the contract requirements, has SvS Design choose the products and returned them to be replaced by new products or the invoice price paid plus costs of sending them to refund. 7.3 If you have a product, for whatever reason, do not wish to diminish, you have the right product within seven (7) days after delivery to SvS Design to return and the agreement to dissolve. Returns will be accepted in this case only if the packaging of the product is undamaged and the plastic seal on the package has not been broken. By SvS Design relevant possibly already received payment shall be submitted within thirty (30) days after the dissolution repaid. The direct costs of return for your account. 8.1 For misverstaan, mutilation, or not quite overcome delays of orders and notices as a result of the use of the Internet or any other means of communication in traffic between you and SvS Design, or between SvS Design and third parties, to the extent relevant to the relationship between you and SvS Design, SvS Design is not liable unless and to the extent that there could have been intent or gross negligence of SvS Design. 9.1 Subject to the other to his rights, SvS Design in case of force majeure the right, at its sole discretion, to execute your order to suspend, or terminate the contract without judicial intervention to dissolve, by writing to you sharing and so without SvS Design obliged to any compensation, unless under the circumstances to standards of reasonableness and fairness would be unacceptable. 9.2 Force majeure means any shortcoming unrefined SvS Design can be attributed, because he is not due to his fault and neither under the law, act or in the traffic force views on his behalf. 10.1 If you SvS Design in writing of an address, SvS Design entitled to that address all orders to send unless you to SvS Design writing of a different address to which your orders are to be sent. 10.2 When SvS Design for a short or long time whether or not tacitly deviations from these conditions are allowed, let that affect his right still direct and strict compliance with these conditions to be claimed. You can never do any right to apply on the grounds that SvS Design these Conditions apply smoothly. 10.3 If one or more of the provisions of these Terms and Conditions or any other agreement with SvS Design contrary happens with any applicable legal provision, the provision will lapse and will be replaced by a SvS Design to establish new legal permissible similar provision. 10.4 SvS Design is empowered to implement your order (s) to use a third party. 11.1 On all rights, obligations, deals, contracts and agreements to which these conditions apply, and these conditions, only Dutch law. 11.2 All disputes between the parties will exclusively be submitted to the competent court in the Netherlands.